Tosa Mitsuoki. 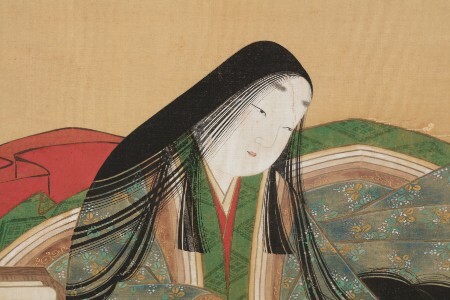 Portrait-Icon of Murasaki Shikibu (detail). 17th century. Ishiyamadera Temple. Courtesy of Ishiyamadera Temple, photo by Kanai Morio. A groundbreaking exhibition inspired by Japan’s most celebrated work of literature will be on view at The Metropolitan Museum of Art. Bringing together more than 120 works from numerous public and private collections in Japan and the U.S.－ including National Treasures and Important Cultural Properties, most of which have never left Japan, this exhibition explores the tale’s continuing influence on Japanese art since its creation. Related events, including performances, lectures and symposiums, will be held to help gain a deeper understanding of The Tale of Genji tradition that spans more than a millennium. Co-organized by The Metropolitan Museum of Art and The Japan Foundation, the exhibition is part of Japan 2019, a series of events highlighting Japanese arts and culture in the U.S. throughout 2019. For more information on Japan 2019, please click here.